Fun Fact: The word xeriscaping comes from a derivation of the Greek word, xeros, meaning dry, and landscaping – thus, dry landscaping. Building rock gardens in Colorado just makes good practical sense within a landscape. Evergreen Landscape & Design has been creating beautiful rock gardens and xeriscape gardens in Evergreen, Conifer, Golden and the Denver metro area for over 15 years. We build rock gardens using moss rock boulders, granite boulders, coble boulders and more. The rock gardens can be finished using materials like pea gravel, river rock, small coble, and granite gravel. Another option is to create a boulder garden and then soften the area up with the use of natural wood mulch like cedar or bark. Boulder gardens or rock gardens are perfect locations for xeriscaping. 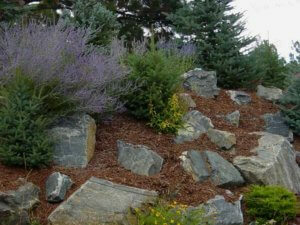 Xeriscaping with rock gardens or boulder gardens allows a space to be filled with beautiful rock and boulder features. Add some low water needs plants and you have a very sustainable low water needs garden. Xeriscaping starts with creating the perfect soil conditions, limiting the amount of water required to sustain the plant materials. Soils should not be too sandy or contain too much clay. If a soil is too sandy, water will leach through and below the plant’s root systems. If a xeriscape gardens soil contains too much clay, water will run off and have a difficult time ever penetrating the soil and reaching the root systems of the plants. Next, make sure that any irrigation system is functioning efficiently. Spray heads are the easiest way to water areas, however the least efficient. Try using sub surface watering or drip in place of spray. An irrigation system designed for a xeriscape garden will be tuned to perfection, observing the individual needs of each plant and delivering the adequate amount of water to each plant without over watering them. Irrigation systems should be smart, and professional irrigation systems today have very advanced features built into the computer controls. They can recognize for instance if it is raining or has rained and cancel water cycles to prevent watering when it’s obviously not required. Individual zones can be controlled and watering times are fully programmable to customize almost any desired watering schedule. And finally, select plants that are going have low watering requirements, which are compatible with the soil conditions and the existing exposures of the site. Gardening with xeriscaping techniques will provide a rewarding and sustainable way to garden while conserving the precious water resources of Colorado. Particularly in the dry climate of the Colorado Mountain west, we use native grass seed mixes to provide vegetation that fits our environment and that will actually geminate and survive our climate. We use native grass seeds often in Evergreen, Colorado, and the surrounding communities of Conifer, Golden & Genesee. Creating areas of native seed with a native wildflower mix added is a beautiful look in a mountain landscape. The tricks to a successful grass and wildflower area are planning, timing, soil preparation and proper germination. After you have properly prepared the soil conditions, planting the seed early in the season, prior to the very hot temperatures is important. And then there is the timing. If you have irrigation, then this is not as important. Seeds will need water to germinate. I haven’t met anyone yet who can predict the weather here in Colorado, and planting seed that relies exclusively on rain for germination is a guessing game. If you plant seed and receive consistent moisture for a period of a month then you can expect good results. If you plant seed and then lay back in 95 degree sunny days for a month, well, you will likely be reseeding the areas. If you can set up temporary irrigation, just until the seed is good and on its way, that is another good option. If only we could predict the weather! Hydro seeding can be used to combat the difficulties we face in our dry mountain climate, but it also is no guarantee of success. Hydro Seeding is a planting process that utilizes a slurry mixture of grass or wildflower seed and mulch. The mixture is sprayed from a large tank on to a prepared ground and is often green in color. The mixture can have fertilizers, any combination of seed, tackifying agents or other additives to provide a quick way to apply and plant seed to an area. Hydro Seeding helps seed to germinate in areas without irrigation mostly because it also applies mulch that will protect the seed and helps to retain any available moisture. Hydro seeding will yield higher germination rates than hand seeding and can be very helpful in areas that are too large to be done strictly by hand.